23 | March | 2009 | Holy Hell! The calls to replace the American dollar as the global reserve currency have taken place for sometime, but the voices have been raised from a suggestive whisper to a demanding shout. It is going to happen, it’s just a matter of time. On March 13, China’s prime minister, Wen Jiabao, said he was concerned about the safety of those assets, particularly because huge economic stimulus plans could lead to soaring deficits in the United States, which could sink the dollar’s value. Should China lose its appetite for Treasuries, the United States’ borrowing costs could rise, making it more costly for Washington to carry out economic stimulus packages and for Americans to pay off their mortgages. LONDON (Reuters) – A push by the world’s leading emerging economies to dislodge the dollar as the dominant global reserve currency appears to be gaining momentum even as a weakening greenback adds further urgency to the discussion. The Kremlin document also called for national banks and international financial institutions to diversify their foreign currency reserves. It said the global financial system should be restructured to prevent future crises and proposed holding an international conference after the G20 summit to adopt conventions on a new global financial structure. The video below is just another great video from The Naked Emperor. I originally found it on Hot Air in an entry by Ed Morrissey. The Obama cult of personality marches on. a cult promoting adulation of a living national leader or public figure, as one encouraged by Stalin to extend his power. Let’s not forget this golden oldies. The creepiness factor continues to rise. 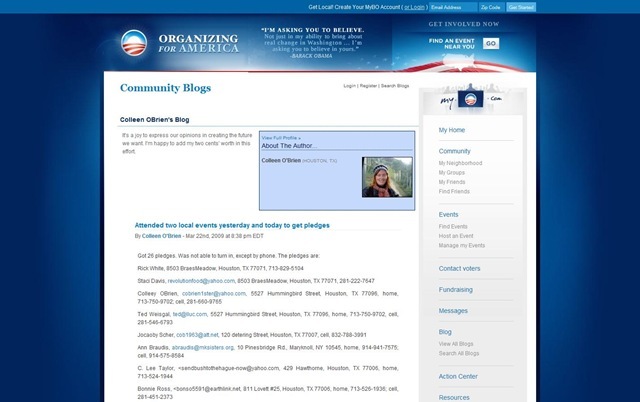 One bright and shining Obama cult member thought it would be a good idea to list on her public Obama page, the names, addresses and phone number of those she had recruited. The image has been kept small to protect the stupid by not allowing their names to be viewed. Here a Trillion, there a Trillion, print a Trillion, every where a Trillion. By the time Obama and Geithner are finished we will all speak of a Trillion in the same way we currently speak of a Billion. _A public-private partnership to back private investors’ purchases of bad assets, with government support coming from the $700 billion bailout fund. The government would match private investors dollar for dollar and share any profits equally. _Expansion of a recently launched Fed program that provides loans for investors to buy securities backed by consumer debt as a way to increase the availability of auto loans, student loans and credit card debt. Under Geithner’s plan for the toxic assets, that $1 trillion program would be expanded to support purchases of toxic assets. _Use of the FDIC, which insures bank deposits, to support purchases of toxic assets, tapping into this agency’s expertise in closing down failed banks and disposing of bad assets.